A recent Hong Kong Trip on Virgin Atlantic gave me a chance to see if the airline was living up to the ”Still Red Hot” advertising campaign. Is my second time on the carrier. I have a great memory of the last trip. Not least because I actually saw one passenger successfully pick up another passenger while sitting at the bar using the line "my wife does not understand me". Innuendo and brand image aside, VS have a fantastic business class product. The style makes me feel more relaxed in the air than the flag carriers of Asia, Australia and UK. The seats have a few issues compared to the more modern herringbone of Cathay Pacific but this is a great seat and airline to fly. For Sydney and Hong Kong VS have the challenge of coming up against the industry leading lounges of Qantas and Cathay Pacific. In Sydney the Air NZ lounge (that VS flyers are invited to) is fine as it is but it is steps behind the travelling pleasure of the Qantas first class lounge with its first class restaurant and endless Veuve Clicquot. In Hong Kong the Virgin Club House is much better and more competitive especially through the quality of the small but enjoyable meal menu but is still behind Cathay's Wing Lounge. If I was travelling onto London all would have been forgiven as the Virgin Club House at Heathrow is my favourite lounge. Nothing beats and sauna and spa soak before a flight. VS were first to launch the herringbone diagonal style flat beat seat (subsequently picked up by Cathay). The benefits of this seat are a quick conversion to a long fully flat bed and no one sitting next to you. The downside is that the seat tends to be narrow especially at the feat. I feel very comfortable and not too crowded in the seated position but lying down to sleep my feet become noticeably pushed together. It does not ruin the sleep experience but the irritation is felt. They make up for this with much appreciated attentions to detail. I am a fan of the seat tables that can be left down but moved in such a way that you can get out of the seat without disruption a meal tray or computer. VS manage to do this with one of the biggest tables in the sky while not interfering with the entertainment screen. The doona/blanket is much more bed like than a standard airline blanket. Similarly the pillow is a traditional size rather that scaled down mini-air format. Both help to compensate for squished feet. There is a real danger when a high end travel companies like VS adopts a service style and approach of being like a cool and sophisticated best friend. There have been times where I have stayed at W hotels in the US where the staff came across and so cool and so sophisticated that I did not feel worthy or welcome. VS are not like that - they get the balance right between making you feel relaxed and happy to be there yet establishing an environment of service and cool. Chatting with the staff in the bar area is a genuinely interesting and fun break from drudgery of a long flight. They can fall into a routine during very busy periods but that is the same with all airlines. The menu is good but that is not the most noteworthy part the VS dining experience. What I like is that I can order the main meal at the time of my choosing rather than according to a fixed meal service. This works better the less passengers there are. On a full flight the staff are very busy so breaking their routine is not as easy but I still find this feature useful. VS have all the makings of a top entertainment system. It is full video on demand with a deep library of movies, TV and audio. Nice mix of recent releases and good older films. But it is annoying how long it takes to start up. Newer implementations on Singapore, Cathay and even United start immediately but VS takes a long time to switch on the system. Once it is turned on you have to sit through another 15 minutes of VS advertising and intro video. This has an impact on the night time HK to Sydney leg. This is a flight that is just under 9 hours. I can normally sleep around 6 hours on a flight so I am looking to watch a film then sleep. If I have to wait 30 mins before the video is turned on then it kills any chance of watching a film. 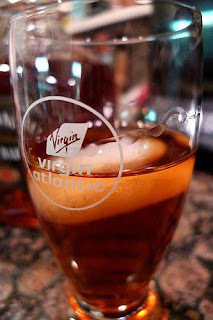 Virgin Atlantic just ooze BOOT Factor. From the bar, toilet mood lighting, the sleeper suit, to the staff attitude there is a feeling of relaxation, welcome aboard and care that you don't find on the attentive but formal Asian carriers, the process driven Qantas and the 'I hate the bosses so much you are lucky I am here at all" attitude of BA and American carriers. I would like to have added the free limo transfer as a BOOT factor item but I was on the one fare class (read cheapest fare class) that was not entitled to the free transfer. I hope you are fine and carrying on the great work you have been doing for the Internet surfers. I am Imran Haider from The Pakistani Spectator (TPS), We at TPS throw a candid look on everything happening in and for Pakistan in the world. We are trying to contribute our humble share in the web sphere. Our aim is to foster peace, progress and harmony with passion. We at TPS are carrying out a new series of interviews with the notable passionate bloggers, writers, and webmasters. In that regard, we would like to interview you, if you don't mind. Please send us your approval for your interview at email address "imran.oracle at Gmail dot com", so that I could send you the Interview questions. We would be extremely grateful.